This week I had a great meeting with some of the staff (I think all engineers) at the Minnesota Department of Transportation. They have a tough job - an impossible job, in fact - balancing priorities within the system we have created. If working with the public, politicians at every level and their own bureaucracy isn't tough enough, doing so in a system where failures can sometimes cost lives makes it all the more difficult. Mn/DOT's list of Major Construction NeedsOn a side note before I get too far: I did two summer internships at Mn/DOT during my undergraduate work. While there I witnessed some of the most worthless bureaucracy I could imagine, but it was the exception. The staff at Mn/DOT, and most DOT's that I have worked with, work hard and are about as efficient as a government agency can be. And on one occasion when an elderly lady went backwards in a right-in/right-out highway entrance and was subsequently killed in an accident, I saw some good people that didn't even know her name break down in tears over the loss. We should respect these guys. While we respect them, they have had a huge part in creating a system that financially is simply not working; that being our state highway system. District 3 of the Mn/DOT system is just one part of the system, but since I have some hard numbers for it, I can give a good example of what I am discussing. According to the presentation we received from Mn/DOT, District 3 gets around $60 million per year in funding. I assume this includes state and normal federal dollars (not earmarks or special funds like stimulus money). Of this $60 million, $50 million goes to maintaining the current system. That leaves $10 million for making "improvements" to the system, which includes such things as highway expansions, signals and overpasses. These seem like big dollars, but in highway funding terms, they are ridiculously small. 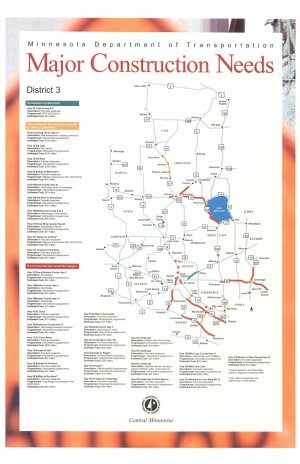 For District 3 alone, there are 11 "Major Construction Needs" projects that are ready or nearly ready to be built. Their total cost: $1.15 BILLION (that is with a "B"). So at our current pace of funding, it will take more than a century to finish the current needs projects. Let's look the major source of funding for highway improvements, the gas tax. Minnesota recently passed a 5.5 cent per gallon increase. According to WCCO.com, every penny in increase yields $32 million. (This may be true, to a point. Once the tax goes so high, people will change their driving habits to avoid the tax. The relationship is not linear, but we'll assume it is to make the point). That means our recent tax increase yields $176 million per year. Working the math the other way, for us to get the immediate needs addresses in say.....five years, it would require a 60 cent per gallon tax increase - and everyone would need to continue to drive as they do now. For comparison, our current gas tax is 25.5 cents per gallon. Improvements to the local systems (which, we have shown, are hurting)? Where will the funding for those come from? Take a step back and look at this situation from a larger perspective. Consider the trends. When we first started building highways back in the Eisenhower administration, we paid for them with cash. From cash, we added "user fees" in the form of gas tax and, in many states, vehicle registration. Over time, we have gradually shifted to paying for highways with debt. We are now considering many other options, like toll roads and now a mileage tax. With all this debt and all this maintenance liability, can we really say we are a richer country today than we were 60 years ago when this all started? Is anyone going to be able to step up and say that the solution is not "more money", but an entirely new approach to transportation? A highway gets built. As it happens, people react. Housing development takes place. Commercial strip malls go up. "The market" reacts to take advantage of this large government subsidy. The roads fill up with the demand induced in this system, bringing the road to capacity quicker than any of the traffic models suggested. Safety problems. Perhaps some tragedies. Cycle repeats. Until we can no longer afford it. That time is now. If we are to continue massive government subsidies of transportation systems, than we are forcing big government to use the heavy hand to regulate land use and the invisible hand of the free market that is distorted from the subsidy. If we can transition to a more market-driven transportation system, then we can demand that government temper its approach and allow the free market to dictate transportation improvements, not the other way around. Either way, as Andres Duany indicated in the video series we posted here over the past couple of months, the only way out of this situation is through mixed-use zoning. Allowing the market to create a mixed-use environment will reduce demand for auto trips and slow our need for ever-more transportation dollars. Only then can we start to get a grip on this massive imbalance.